Aurum est potestas. Unlike other vague or metaphorical mottos, there’s no confusing the meaning of this old Latin phrase—it literally means, “gold is power”. Indeed, gold is a precious metal that has endured throughout the ages as a symbol of both affluence and reliability. In times of uncertainty, people have clung to gold to sustain them. When you see its deep yellow luster adorning jewelry and various décor, you automatically think of wealth and riches. When someone says “treasure”, it’s usually accompanied by images of large chests brimming with gold coins (and maybe a few pirate ships, too). Indeed, the mining history of any place is always sure to be ripe with fascinating stories. Have you ever wondered what it was like to be a miner panning for gold in those days? Have you ever wondered what the first gold discovery in the United States must have been like? To answer this question, let’s look towards the Atlantic coast and set our sights upon North Carolina. As one of the original thirteen states, you’d expect it to have a deep and rich history, and boy, it doesn’t disappoint. The Reed Gold Mine is a National Historic Landmark in this state, and is home to the first documented gold find in the entirety of the U.S. 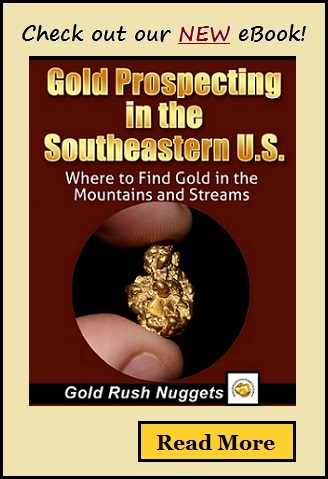 This discovery led to the Carolina gold rush of 1799, the very first of its kind in America. This initial gold discovery led to the establishment of the gold mining industries of the other southern states as well. North Carolina was the top state in gold production up to 1848, after which the California Gold Rush began. So how did it all happen? Back in those days, much of the land was still agricultural. A farmer of German descent named John Reed (formerly Johannes Reith) settled in North Carolina’s Piedmont region, in modern day Cabarrus County. Like many of those who dwelt in the area, he resided in a family-run farm, raising various crops and some livestock. One day in 1799, Reed’s young son Conrad went down to a small stream with his sister and younger brother to catch some fish. This stream was called Meadow Creek, and in its waters, the first documented gold discovery was made. Conrad decided to take the large yellow rock home to his father who then took it to a silversmith. However, as gold was a largely unknown metal during those times, the Reed family used it as a doorstop in their family home. Can you imagine a rare 17-pound gold nugget being used to hold a door open for years and years? In 1802, its value was finally recognized when a Fayetteville jeweler identified it and purchased it for a meager $3.50. If Mr. Reed had known that the value he’d asked for was even less than 1% of its actual value, he may not have parted with it so quickly. Despite being a simple man, John Reed was still an enterprising one. He returned to the site of the gold discovery, and along with three local men, began mining the stream for more of those profitable gold nuggets. All those involved still focused on raising crops, but any free time was devoted to digging for gold in the creek bed. In the first year, a 28-pound gold nugget was unearthed and by 1824, an estimated yield of $100,000 worth of gold had been found. Of course, most lucrative ventures are hard to keep secret. Upon hearing of the Reed gold discovery and subsequent mining activities, more and more farmers in the area began to explore the creeks in their own land. The Piedmont region and other areas in North Carolina soon saw increased efforts to find the precious metal as what is known as the Carolina Gold Rush took place. Locals had unearthed such a significant amount of gold that even foreigners came to take part in the rewarding business. Much of the gold mining activity was focused on placer gold, but underground mining activities soon began in 1825. It was in that year that locals discovered gold in veins in white quartz rock. However, unlike placer mining, searching for lode gold required more equipment, manpower and in turn, more money. Because of this, it was only in 1831 when underground gold mining was in full force at the Reed mine. The mine remained profitable for many years, but family issues led to its decade-long closure after 1835. After John Reed himself passed away in 1845, the mine was sold at a public auction. The final recorded underground mining activity took place in 1912, but several areas of the mine are still open for viewing today. The Reed Gold Mine has been restored and preserved quite well, and dubbed a National Historic Landmark. The story of John Reed and America’s earliest recorded gold discovery can be viewed in the visitor’s center, along with some old mining equipment exhibits. Along with its guided tours and winding trails, the area also serves as a beautiful picnic site—truly well worth the visit!